The gang of young men that forms spontaneously in a section of town does not recruit members or charge a subscription; it is a matter of recognition and internal organization. Organizing such a collective depends not only on the words that are said, but on the formation of images underlying the constitution of any group, and these seem to me something fundamental - the support upon which all their other aims and objects rest. I do not think one can fully grasp the acts, attitudes or inner life of any group without grasping the thematics and functions of its 'acting out' of phantasies. 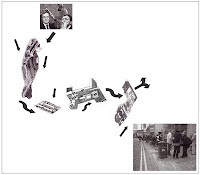 Axis of Exploration and Failure in the Search for a Situationist "Great Strike"
The above map is appropriated from the Situationist map by Guy Debord called Axis of Exploration and Failure in the Search for a Situationist "Great Passage" (1957). My map is based on the recent education-related strikes in Leeds, in particular at the University of Leeds and Leeds Metropolitan University in the last year. My own image takes sections from various University of Leeds maps, it includes a photo I took of the J30 strike in June, and I'll leave you to work out what the top image is . . .
...a novel sort of map, or perhaps we might better say a work that stands halfway between the realms of art and cartography...This was one of a series called 'psychogeographic' maps he made of Paris at that moment, maps intended to chart "the specific effects of the geographic milieu, consciously planned or not, acting on the affective comportment of individuals." It in fact records one particular expedition...undertaken three years earlier by Debord and Chtcheglov (seen in their photograph at the top left) across their favored neighborhoods on the Left Bank, pictured in four collaged aerial photographs linked by arrows signalling various possible routes of entry and egress from one 'ambiance' to another. At the bottom right we find a poetic emblem of this voyage, a reproduction of Claude Lorrain's Seaport with the Embarkation of Saint Ursula of 1641...The three elements together - along with the work's title, which characteristically unites a rather dry, technical description with the fanciful reference to the 'great' (that is, northwest) passage sought by explorers from Christopher Columbus forward in their quest for a more direct route to the east - produce an idiosyncratic plan of the city, one that privileges psychology as much as topography. Please note: Unfortunately I cannot find a link to the original map of Debord's, although it is reproduced in McDonough's text, which is actually the first time I came across it. In his article originally appearing in the Architectural Review in January 1974 but also reproduced in the Henry Moore Institute publication The New Monumentality (2009), Lance Wright refers to how the campus development at the University of Leeds in the 1960s was oriented around "university-as-ideal-city". (2009: 33) The development, led by the architects Chamberlin, Powell and Bon (CPB), was considered at the time to be both an attempt to create a kind of university-as-city in its own right, but also to integrate the university itself into the city of which it belonged. Even more so today, campus universities are relatively self-contained inasmuch as they house all the facilities and amenities required for students not to just study but also to live and socialise: supermarkets, eateries, cash-machines, bars and clubs, and a variety of shops from travel agents to opticians. Because the ideology behind the massive sixties development plan for the campus orients it within a city-based model, it serves us to consider some of the relevant texts that take a postmodern aesthetic and subjective perspective on the city as an object of study. Another interesting and relevant aspect of Raban's text looks at ideas around the concept of reason that have historically been attached to texts on the city, in particular because of the dichotomies around urban/rural and refined/uncivilised. (1998: 153) In postmodernity this idea of reason could be transferred to a view on the rationalist approach attached to capitalism, especially the rhetoric in circulation concerning it. Not just the idea that countries that are capital-generating are considered to be more civilised than those that are not, but, also, the expressions that are promulgated, dismissing any alternative model of living than the consumerist one. Texts on the city also lend themselves to being used for analysing campus space because the posthistoric university has many qualities that are comparable to city living. The university puts consumers and products into circulation, enabling an analysis from the perspective of networks and flows. Space is designed, from a rational standpoint, to control the flows of people, machines and materials in a way that encourages the efficient running of university space while also supporting the ideology behind it. This means that the campus can be analysed from the perspective of how capital might use and acquire that space, for example, through capital accumulation. Also, the university, like the city, has an appearance in the form of which it appears, its referent. The university, in manifest form, is a representation, supported by a particular discourse, which means it can be deconstructed linguistically. Wright, Lance. 2009. ‘University of Leeds: Criticism’, The New Monumentality (Leeds: Henry Moore Institute) pp. 32-34.